The Eleaf iJust 3 Starter Kit is here just for you! It consists of an Eleaf iJust 3 battery mod and an Ello Duro atomizer. The iJust 3 is powered by an internal 3000mAh battery to pair with the new ELLO Duro Sub-Ohm Tank. The Innokin ENDURA T18 Starter Kit, is possibly the best beginners Kit available as well as a solid device for experienced vapers looking for a simple and sleek design. The Innokin ENDURA T18 with cyan colour delivers a superior experience in a compact, durable and affordable all in one starter kit. VK Extreme Ice E-liquid 50ml gives you great vapor and great flavour. This flavour is so intense that it will make your taste buds scream for more, absolutely tastes like the real thing. Our brand e-liquid is a very high quality product, customer satisfaction guaranteed, so buy now. VK Beetle Juice E-liquid 30ml is made from the freshest ingredients creating this superbly made flavour you won't forget. Our e-liquid is made right here in Australia from organic ingredients giving you superb quality e-liquid, so buy now customer satisfaction guaranteed. VK Menthol Sensation Flavor E-liquid 10ml gives you great vapor and great flavor. Our brand e-liquid is a very high quality product, customer satisfaction guaranteed, so buy now. Premixed VG-PG 500ml is the ‘Base’ or also known as 'Unflavoured' e-liquid and is the main ingredient of E-liquid. The e-liquid contains Vegetable glycerin and/or Propylene glycol, both are non toxic and are food grade. This product is great for starting your own hobby, for fun or even making your own e-liquid brand for retail purposes. VK Musk Candy Stick E-liquid 30ml is made from the freshest ingredients creating a real musk candy flavour, giving you an awesome vape experience you won't believe. Customer satisfaction guaranteed, so buy now. Vaporesso VECO PLUS SOLO 3300mAh Vape Pen Blue is a new pen style vaping device from Vaporesso, which includes built-in 3300mAh battery and 4ml e-Juice Tank. The included ECO Universal Coil will deliver the most original flavor of your e-liquid. You will enjoy a great vaping with the VECO PLUS SOLO. VK Magma Delight E-liquid 30ml is made from the freshest ingredients creating this unique but very yummy flavour. Mixed with strawberry, mango, berries and black current giving you an awesome vape experience you won't believe. Customer satisfaction guaranteed, so buy now. VK Chocolate Glazed Donut E-liquid 30ml gives you great vapor and great flavour. This flavour will make your taste buds scream for more, absolutely tastes like the real thing. Our brand e-liquid is a very high quality product, customer satisfaction guaranteed, so buy now. VK Smoked Tobacco E-liquid 30ml is made from the freshest ingredients creating a yummy real smokey tobacco flavour which will give you a surprisingly awesome vape experience you won't believe. Customer satisfaction guaranteed, so buy now. VK Cinnamon Danish Swirl E-liquid 30ml gives you great vapor and great flavour. This flavour will make your taste buds scream for more, absolutely tastes like the real thing. Our brand e-liquid is a very high quality product, customer satisfaction guaranteed, so buy now. EVOD-MT3 900mAh Black Vape Pen Kit is a high quality product which is very basic to use and easy to carry around with you. You cannot go wrong in buying this simple but very reliable product that produces great vapor and flavor at the same time. Customer satisfaction guaranteed, so buy now and save. There is something irresistible about Key Lime Pie E-liquid. Like its cousin lemon meringue, key lime pie is mouth-puckering tart and a smile-making sweet, like a pie version of lime flavored starburst candy, but in custard form, surrounded by whipped cream. VK Pineapple Supreme E-liquid 30ml is made from the freshest ingredients creating a real sweet juicy pineapple flavour which will give you an awesome vape experience you won't believe. Customer satisfaction guaranteed, so buy now. VK Mochaccino E-liquid 50ml gives you great vapour and great flavour. This Mochaccino flavour is made from real coffee and chocolate making a real refreshing yummy mochaccino taste. Our brand e-liquid is a very high quality product, customer satisfaction guaranteed, so buy now. VK Mystic Dream E-liquid 30ml is a very unique flavour that will keep you guessing! The Mystery Flavour will keep you guessing, is it fruity, candy? or is it a desert? who knows but it really tastes great. Vapor King VK Watermelon E-liquid 30ml is made from the freshest ingredients creating a real yummy unique flavoured e-liquid. The unique sweet and juicy flavor of Watermelon makes for a refreshing all-day vape. Watermelon is a versatile flavor, and it tastes delicious with liquor, fruit, and cola flavors. Panasonic NCR 18650 2 Pack Flat Top Batteries are for High-Power E-cigarette users, or for anyone who is looking for the longest run time possible. This is one of the largest REAL capacity cells available on Aussie market. VK Red Bull E-liquid 50ml gives you great vapor and great flavor. This Red Bull flavour does surely give you wings and much more just like the drink you can really taste it. Our brand e-liquid is a very high quality product, customer satisfaction guaranteed, so buy now. VK Wicked Strawberry Flavor E-liquid 30ml has a delicious strawberry candy taste you cannot resist. Our brand e-liquid is a very high quality product, customer satisfaction guaranteed, so buy now. VK Virginian Tobacco Flavor E-liquid 30ml gives you great vapor and great flavor. Our brand e-liquid is a very high quality product, customer satisfaction guaranteed, so buy now. Vapor King VK Marlboro Tobacco E-liquid 30ml is made from the freshest ingredients creating this unique and superbly made tobacco flavour which will make you crave for more. Our e-liquid is made right here in Australia from organic ingredients giving you superb quality e-liquid, so buy now customer satisfaction guaranteed. VK American Blend Tobacco E-liquid 30ml gives you great vapor and great flavor. Our brand e-liquid is a very high quality product, customer satisfaction guaranteed, so buy now. VK Unicorn Dream E-liquid 30ml gives you great vapor and great flavour. The Unicorn dream flavour has quenching fruity and candy like taste with just a touch of rum giving you a unique flavour experience you cannot resist. Our brand e-liquid is a very high quality product, customer satisfaction guaranteed, so buy now. VK Menthol Sensation Flavor E-liquid 30ml gives you great vapor and great flavor. Our brand e-liquid is a very high quality product, customer satisfaction guaranteed, so buy now. VK Black liquorice E-liquid 50ml is an exciting flavour that tastes just like real black liquorice, this flavour also is a great mixer with tobacco e-liquids or simply vape on it’s own. Gives a surprisingly awesome taste and vape experience you won't believe. Customer satisfaction guaranteed, so buy now. VK Chocolate Flavor E-liquid 30ml gives you great vapor and great flavor. Our brand e-liquid is a very high quality product, customer satisfaction guaranteed, so buy now. EVOD-MT3 900mAh Stainless Steel Vape Pen Kit is a high quality product which is very basic to use and easy to carry around with you. You cannot go wrong in buying this simple but very reliable product that produces great vapor and flavor at the same time. Customer satisfaction guaranteed, so buy now and save. 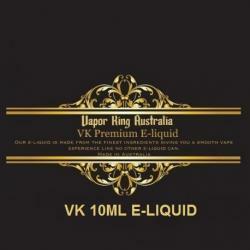 Vapor King Australia, is Australia's Largest e cigarette vape shop. We sell a huge range of e cigarettes, vape kits and Vapor King e liquid. At Vapor King Australia, we have a tendency to deliver the most effective tasting e-liquids inside all our gracious flavourings. Our e-cigarette and vape merchandise are perpetually evolving and our regular users love each vape kit and e-liquid we tend to adapt overtime! we offer the most appeasing merchandise, from vape kits, e cigarette accessories to our premium Vapor King e-liquid, manufactured here in Australia. We have a tendency to turn out solely the very best quality vape products, making certain the delight of our customers and their anticipation to return back to us. So buy now online and vape on Australia. Vapor King is an authorized retailer for every product we sell. That means you'll receive the full warranty when you purchase products from our website. Since we buy our units directly from the manufacturer, you can also be assured that you'll also receive the actual product that is being advertised (OEM) – no knock-offs. Note: Be cautious when purchasing products from a website that is not an authorized retailer. Many manufacturers will not honor the warranty if the product is not purchased from an authorized retailer. All Products are shipped by Australia Post, at a fixed rate and not by weight. We also do express shipping for e-liquid only via Australia Post Express, which all rates do apply. Vapor King Australia, are Australia's largest e cigarette vape shop and e cigarette supplier online. Vapor King sells a huge range of e-cigarette products such as vape kits, vape pens, e cigarette accessories and our very own Vapor King e-liquid throughout Australia at very affordable prices. All our machines are authentically genuine. If you see websites selling these products any cheaper they may be not the genuine product instead an imitation (clone) of the genuine thing. We make sure our customers get the highest quality vape machines and e-liquid in Australia.